With the grand opening and dedication of the Smithsonian National Museum of African American History and Culture (NMAAHC), we see history being redefined and shaped right before our eyes. Linda Crichlow-White is a well-known educator and author of “Back Then, There,” as well as being a former Petworth resident. While cleaning out her Aunt Edna’s DC apartment, Linda discovered old beauty products and supplies, posters, handbills and other significant items that she donated to the NMAAHC to add to their collection. 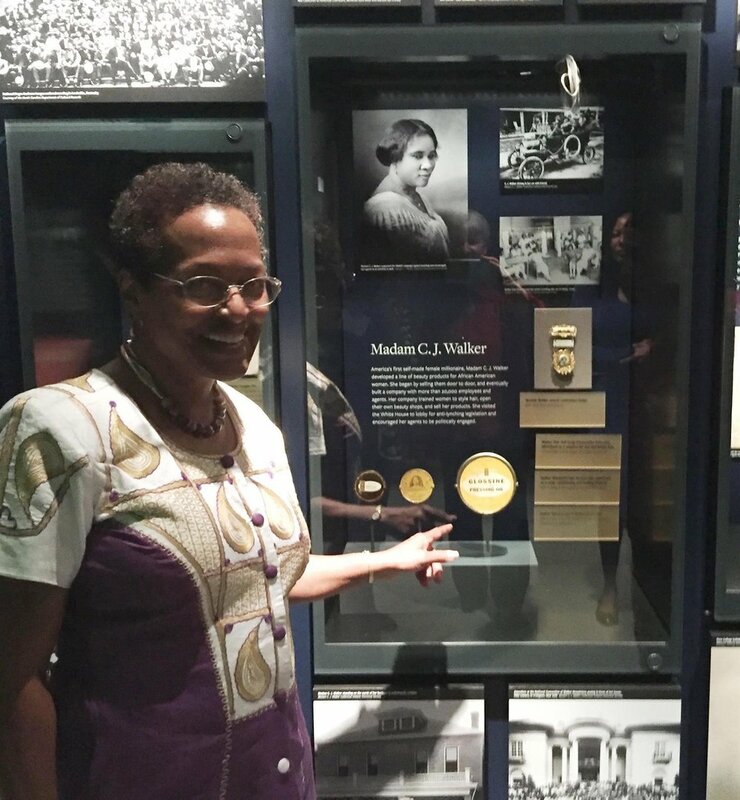 The tin of hair pomade currently on exhibit at the museum was from the days when her aunt attended Madam C. J. Walker beauty school. An astute business woman, Madam Walker knew the importance of marketing and branding her products way back when. Linda said she did not notice the tin of pomade had Madam Walker’s name on it until she saw it in the showcase at the museum. The hair pomade she gave to the museum. The significance of Madam Walker’s accomplishments were great, especially at a time when segregation and Jim Crow Laws were the norm. She was an entrepreneur, philanthropist and a political and social activist. Walker was also the first female self-made millionaire in America. She made her fortune by developing and selling her line of beauty and hair products for black women through her “Madame C J Walker Manufacturing Company.” Prior to Walker, black women in America had few options when it came to hair care. Cosmetology and beauty shops helped to secure many families a solid place in the rising African American middle class. Walker’s beauty business employed thousands and trained more than 20,000 people at the height of the business. Door-to-door sales were an important part of the marketing strategy to reach black consumers. A receipt from 1958 from the Madam CJ Walker School, from Linda's collection. Soon, many women were being trained in haircare by CJ Walker beauty schools, and they went on to establish their own small beauty shops. The beauty shop offered a sense of community to the African American population. It was a place to relax and pamper yourself while sharing personal stories, local and national news, including race relations in America. Beauty shops were also a place for networking and connecting to secure scarce resources within the community. President Barack Obama said during his dedication speech how everyday African Americans across this nation went into their attics and basements and retrieved items they have been holding onto for so long. Giving one’s personal family treasures/heirlooms to the museum gives the items a home and a place in history. A place where the items will be forever immortalized under the watchful guidance and protection of the Smithsonian Institution. A picture of Linda's Aunt Edna receiving her graduation certificate from the Madam CJ Walker School. A curator from the Smithsonian collected the tin of hair pomade from Linda for display, along with twenty other artifacts that depict African American life and culture. Something that stood out on my visit was an exhibit that summarizes the African American journey, which said “Making a way out of no way.” Visit the museum and share the experience as the journey continues. Lois is a native Washingtonian and proud parent of two daughters who recently graduated from college. She is the founder and Director of the District of Columbia African American Legacy Foundation (DCAALF), a grassroots organization that helps underserved populations. Lois is also the creator and producer of the “The Pride and Promise of Petworth” documentary. Ms. Cooper credits Petworth with helping her to develop into the person she is today. You can email Lois with questions or suggestions on articles about social issues.